What a beautiful spring day! It was nice that you opened the nets, so I didn’t have to deal with the heavy frost this morning. It was a typical Ruthven clear sunny day: quiet in the nets. We banded 16 birds, as follows. 1 MODO, 3 BCCH, 1 SOSP, 1 SCJU, 1 BHCO, 1 HOFI, and 8 AMGO. We had some interesting retraps (13) as well. 1 DOWO, 1 TRES, (that I think may be a foreign banded bird), 1 WBNU (Banded by Marylene Boulet in 2002 as a ASY and not seen since. This bird is now after 6 Yrs old) 1 SOSP, 6 SCJU, and 3 AMGO. On census Louise Unitt was the first to spot 2 MYWA’s, the first for Ruthven for the season. The warbler migration has begun!! 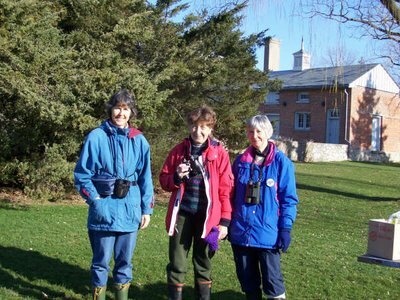 We had 3 visitors from the Hamilton Naturalists’ Club today. Starting from the left: Louis Unitt, Elaine Serena, and Shirley Klement. As mentioned above, Louise was the one who spotted the first Myrtle Warbler of the migration. A little more action at Selkirk today, especially kinglets. Overall a fairly good day. The local ETTI has become vocal the last couple of days. As well as the Myrtle Warblers (Yellow-rumped Warblers), there were also a couple of White-throated Sparrows singing – their song, along with that of the Common Loon, being synonymous with the boreal forest, conjures up visions of the north – tamarack thickets, alder swamps and wild, wild lakes. Spring is upon us!